My new Baby, well not really a baby. 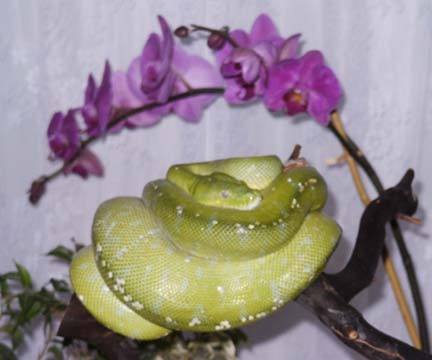 Here are some pics of my new green tree python. I am new to GTPs but not to snakes. I have wanted one of these for years but was afraid in a way and they were a little too expensive. Well a friend of mine twisted my arm into it. Just wanted to share these with everyone. Here he is with some Orchids. Here he is in his enclosure I bought him in.